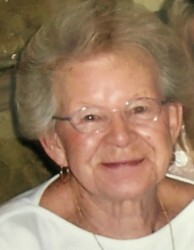 Obituary for Chestine J. Soczyk (nee Wrona) "Tess" | Castle Hill Funeral Home, LLC. Chestine J. Soczyk (nee Wrona) "Tess", born May 4, 1925 in Hammond, IN passed away February 1, 2019 at the age of 93. She is survived by her beloved husband of 69 years, Henry P. Soczyk, whom she married on September 10, 1949; children: Deborah (Joseph) Stalmack, Gregory Soczyk, Sandra Soczyk and Linda (Robert) Beck; grandchildren: Todd (Kathryn) Stalmack, Allison (Andrew) Hafertepe, Jessica (John) Jamicich, Kristina, Casimer and Bradley Soczyk, Jeffrey and Jonathan Beck; great-grandchildren: James, Jack and Luke Stalmack, Henry and AJ Hafertepe, John and Cameron Jamicich, and Jacob Soczyk. Chestine was preceded in death by her parents Joseph and Rose (nee Pajek) Wrona, sister Irene (Edward) Trinkle, and brothers Matthew and Eugene Wrona. Funeral Services will be Wednesday, February 6, 2019 with a visitation from 9-10:45 a.m. at Castle Hill Funeral Home: 248 155th Place, Calumet City, IL 60409 to St. Andrew the Apostle Church for a 11:00 a.m. Mass of Christian Burial followed by Interment Services at Holy Cross Cemetery. Chestine was a member of the Polish National Alliance and Polish Falcons of America. In lieu of flowers, memorials to Ann & Robert H. Lurie Children's Hospital of Chicago or St. Jude Children's Research Hospital appreciated. For service information (708)862-4480 or visit castlehillfuneralhome.com for online guestbook.